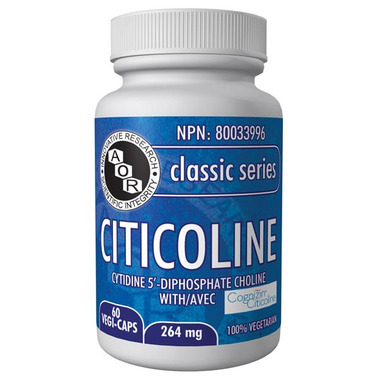 AOR Citicoline is cytidine 5'-diphosphate choline, a phospholipids booster that can help optimized your brain function. Citicoline plays a crucial role in the Kennedy pathway, by which the body synthesizes phosphatidylcholine (PC) and, ultimately, other phospholipids, such as phosphatidylserine (PS). Citicoline supports the maintenance of good health. Adult Dosage: Take 2 capsules daily with/without food, or as directed by a qualified health care practitioner. AOR Guarantees: that no ingredients not listed on the label have been added to the product. Contains no wheat, gluten, corn, nuts, peanuts, sesame seeds, sulphites, mustard, soy, dairy, eggs, fish, shellfish or any animal byproducts.